Xpedition� Enterprise from Mentor Graphics is the industry's most innovative PCB design flow, providing integration from system design definition to manufacturing execution. Its unique, patented technologies can reduce design cycles by 50 percent or more while significantly improving overall quality and resource efficiency. Mentor Graphics Corporation announced the new Xpedition printed circuit design (PCB) flow to address the increasing complexity of today's advanced systems designs. The increasing densities of electronics products are forcing companies to develop highly compact system designs with more functionality, and at lower costs. Integration with Mentor's leading HyperLynx high-speed analysis technology enables optimization of signal and power integrity across complex rigid-flex stack-up structures. For fabrication preparation, the Xpedition flow provides all flex and rigid information using the ODB++ common data format. This methodology eliminates data ambiguities by clearly communicating the finished board intent to the fabricator. The new Xpedition flow is the optimum solution designed specifically for flex and rigid-flex design, from conception through fabrication output. - Definition of the rigid-flex stack-up with unique outlines for each region, enabling simpler design changes than stack-up by zone. Standard flex materials (e.g. laminates, 'embedded' or 'bikini' cover layers, stiffeners, adhesives, etc.) can be included in the stack-up. - Full support of flex bends to manage where and how the PCB bends, including parts placement on flex layers, flex routing, plane shape fills, tear drops and trace drops. Once bends are defined, the design can be viewed and validated in 3D to ensure there are no collisions. - Powerful user interface with intuitive and simple selection controls to properly manage the design. - Electrical rule checking (ERC) using a customizable local rules checker and a comprehensive set of post-design checks for first-pass success. - Flex-aware signal and power integrity analysis, enabling accurate modeling of interconnect as it passes through different stack-up regions. - Design for manufacturing (DFM) validation and new product introduction (NPI) tools to ensure seamless PCB design to fabrication management and efficiency. - Tabbed routing, an interconnect geometry used to minimize crosstalk and impedance discontinuities, can be created and modified on high-speed traces. - Designers can create and modify a routing strategy with sketch plans that define a path for trunks of nets, including trace shielding. - Enhanced tuning enables better feedback and control during interactive editing to achieve high-speed constraints. - Nets which require back drilling can be defined in layout and output for manufacturing. - Engineers can import Polar stack-ups and layer mapping directly into the constraint manager to simplify design start-up. - A new user interface enables review of all design rule checks in the design for quick identification and resolution of electrical and manufacturing design violations. Supported processors and systems are those manufactured since 2008 which conform to the subsequent requirements. Intel Celeron processors are not recommended. 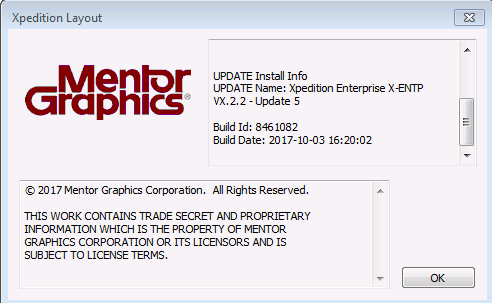 Mentor Graphics Xpedition Enterprise VX.2.2 Update 5 (x64) | 2.31 GB download links are provided by Extabit Rapidshare Uploaded Rapidgator Netload Bitshare Freakshare Letitbit Dizzcloud and more.